But there are now several scientific studies to back it up. Many pet owners have had some pretty impressive successes in healing their pets with Colostrum. In fact science has now found that colostrum is beneficial for 5 specific dog and cat health conditions: Protecting against anti-inflammatory medication side effects, Inflammatory Bowel Disease, Immune Supportive Benefits, Weight Loss and Allergies. 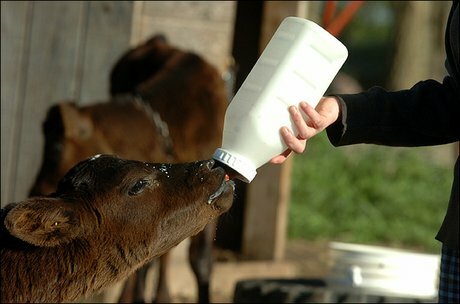 Colostrum is the mother’s first milk – and vitally important to keeping young animals healthy. This special substance offers the newborn, several powerful immune enhancing properties. Immunoglobulins (Ig’s). They function as antibodies and are generated by the body in response to foreign substances (antigens) such as infectious microbes. Lactoferrin is an iron-binding whey protein found in the milk of most mammals, it contains 703 amino acids. Lactoferrin is able to bind to pathogens invading the body. It appears to play several biological roles. Owing to its iron-binding properties, it appears to be the source of iron and have antibacterial, antiviral, antifungal, anti-inflammatory, antioxidant and immunomodulatory activities. Lysozyme is an enzyme, commonly referred to as the body’s own antibiotic, It is abundantly present in secretions such as, tear ducts, milk and colostrum. It has the ability to destroy cell walls of certain bacteria. It is able to catalyse the inactivation of a wide range of micro-organisms. Lactoperoxidase is an enzyme present in colostrum. It possesses its own antimicrobial properties against gram-positive organisms and exhibits pH dependent bactericidal action against gram-negative organisms. Growth Factors are substances made by the body that function to regulate cell division and cell survival. IGF 1 and 2 (insulin like growth factor) These growth factors are the most prevalent in colostrum and the body and is key in the reproduction of our bodies cellular tissue, this assist athletes in recovery times after events as well as after injury. Being an IGF-rich supplement it promotes a healthy gut through turnover of the intestinal lining, increased uptake of dietary components and increased immunological performance. Gut micro flora play a vital role in digestion, nutrient absorption and immune function. If there is an imbalance in the intestinal micro flora this may upset the digestive process and impact on the immune system, the use of Colostrum can keep your gut at optimal function. Here are the 5 most important health benefits with scientific studies to back them up. Nonsteroidal antiinflammatory drugs (NSAIDs) are widely prescribed and are effective in the treatment of musculoskeletal injury and chronic arthritic conditions. Nevertheless, 2% of subjects taking NSAIDs for 1 y suffer from gastrointestinal adverse effects, including bleeding, perforation, and stricture formation of the stomach and intestine . Acid suppressants and prostaglandin analogues have been shown to be effective in reducing gastric injury induced by NSAIDs but are less effective in preventing small intestinal injury. Novel therapeutic approaches to deal with these problems, such as the use of recombinant peptides, are therefore still required. A recent series of in vivo and in vitro studies support this idea; EGF and TGF- and TGF-ß have all been shown to reduce NSAID-induced gastric injury. The beneficial effects of recombinant growth factors on NSAID-induced small and large intestinal injury is, however, less well documented. It was shown recently that a defatted colostrum preparation, which is rich in the growth factors discussed earlier, reduced NSAID-induced gastric and intestinal injury in rats and mice . This material was also shown to effectively reduce gastric erosions in human volunteers taking NSAIDs (J Hunter, personal communication, 1998). Further support for this approach comes from our recent finding that this defatted colostrum preparation reduced small intestinal permeability, which was used as a marker of intestinal damage in human volunteers taking clinically relevant doses of the drug indomethacin. Clinical trials involving patients taking NSAIDs long term are under way. Studies examining the effect of administration of EGF, PDGF, TGF-ß or IGF-I in animal models of colitis have had encouraging results, and a cheese whey growth factor extract containing several of these growth factors had positive results in a similar model. increasing the absorption of nutrients from the gastrointestinal (GI) tract. to treat a variety of species. Also contains growth factors, such as somatomedins, positively affect the intestinal cells, stimulating wound healing, increased absorption of electrolytes and nutrients. Colostrum supplementation has been shown to help increase lean body mass. Lean mass gains lead to increases in basal metabolic rate (BMR), or the energy your body needs for all its functions, such as breathing, circulating blood, hormone level adjustment and growing and repairing cells. Increased energy expenditure increases weight loss. Colostrum has a role to play in weight loss. Shing, et al., suggest that 20 to 50 grams a day of colostrum, combined with other high-quality proteins, such as whey and casein, yield the greatest benefits. Research has found an ingredient known as praline-rich polypeptide (PRP) in bovine colostrum; it appears to be what is helping decrease the allergy symptoms. The colostrum dose for dogs with allergies varies based on the company; I advise giving ¼ of the human dose per 20lbs daily. My supplement, Ultimate Canine Health Formula contains bovine colostrum in adequate levels for your dog. P.S. First its good news that this is becoming more mainstream. Obviously much of the colostrum that is ingested is broken down in the stomach/intestinal tract, BUT it still clearly can have certain benefits. Hello! I have 1 year old cat with possible fungus or cancer in nasal cavity. He is underdeveloped or miniature at merely 3.5 lbs. Currently taking antifungal, antibiotic, standard process feline supplements for immune, overall health and encentric, and cannapet. I heard about colostrum and would like to try this for him however where to find quality product and dosage considering his weight is a concern. Max is a super sweet kitten, and I would like to give him what he needs to be a normal healthy cat with a long life ahead of him.